In this article, I will talk about one specific type of the above concepts i.e. Strengthen and Weakening arguments. 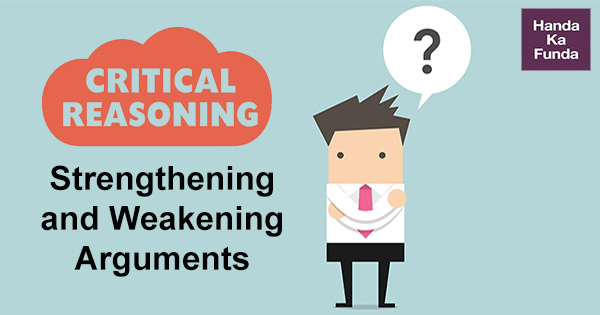 First, it needs to understand what does Strengthen and Weakening arguments mean? Let’s understand it. In general sense, argument means quarrels but in logic and critical reasoning, an argument is a list of statements one of which is conclusions and others are the premises or assumptions of the argument. In reasoning, arguments are based on certain premises; these premises are facts that are explicitly stated and acts as in support of the argument and further the arguments make certain assumptions; these assumptions are implicit, they are not stated and they also provide support and using the support of these two, the arguments reach a certain conclusion. Arguments by example: the premise is stated with the help of an example. Arguments by analogy: the supporting premise is the analogy between two objects. Arguments by chronology: the supporting premise is the chronological study of facts and the conclusion is based on this. Arguments by cause and effect strategy: the supporting premise is a cause and the conclusion are the effect. The hidden assumptions are supported by a fact of the same nature. The conclusion itself is supported by a fact of the same nature. The key to strengthen argument is finding the answer choice that confirms that the central assumption is correct. If you encounter an answer that would be correct on the assumption question, it would be correct on the strengthen question as well. Also, the correct answer can confirm by citing a study, survey or any other relevant piece of evidence that makes the assumption to be more likely to be true. An answer that weakens the argument can directly refute the assumptions. Any answer that states the assumption is incorrect will weaken the argument. Any new information presented in an answer choice that makes the assumption less likely to be correct will act to weaken the argument as a whole. we prove the example itself is totally correct (incorrect). we support (contradict) the assumption. we support (contradict) the conclusion directly or by some other means. Let’s do some examples to develop the application of the above-suggested method. Example 1: We must follow the policy of non-violence because Gandhiji used to practice it. Statements: I. Even lord buddha advocated non-violence. We must follow our great leader’s example. III. Non-violence is our constitutional obligation. At certain stages, Gandhi Ji also advocated violence. It is not necessary, that whatever Gandhi Ji did must be correct. Non-violence has been declared to be an unconstitutional policy. Which of the following statements would strengthen and weakened the argument? Sol: The above argument is the argument by example. Now let’s analyze the above argument into the premise, hidden assumption, and conclusion. Break-up Gandhi ji used to practice non-violence. What Gandhi Ji did must be correct. We must follow the policy of non-violence. (supports premise/assumption/conclusion) Even Lord Buddha advocated non-violence. We must follow our great leader’s example. Non- Violence is our constitutional obligation. (supports premise/assumption/conclusion) At certain stages, Gandhi ji also advocated violence. It is not necessary, that whatever Gandhi ji did must be correct. Non- violence has been declared to be an unconstitutional policy. Example 2: Pakistan and Bangladesh have suffered defeats at the hands of Indian cricket team. So, India must defeat them in tennis as well. Break-up India has defeated both countries in cricket. What happens in cricket also happens in tennis. India will defeat both countries in tennis also. (supports premise/assumption/conclusion) In fact, India has been defeating them for the past ten years. Cricket and tennis are very similar games. (supports premise/assumption/conclusion) But India has been losing to them also. It is not necessary, that what will happen in cricket also happens in tennis. We could not have any statement that strengthened or Weakened the conclusion directly because the conclusion is in the future tense and we cannot support or contradict the future. Example 3: The government has announced a devaluation of the rupee against the dollar by at least 20%. Economists have criticized the step staying that it would bring inflation into the economy. Sol 3: This type of Argument is based on cause-and-effect relationship. Break up Economists have criticized the devaluation of the rupee by 20% · Economists are correct*. There will be inflation in the economy. · Devaluation is a cause and, inflation is its effect. (supports premise/assumption/conclusion) Devaluation of rupee could be avoided by taking some other measures. · Economists must have some merit in their criticism. · Whenever there is devaluation, inflation follows. · Inflation is not good for the health of the economy. (supports premise/assumption/conclusion) Devaluation was long overdue in the economy. · It is not necessary, that whatever economists say is correct. · Devaluation may not always result in inflation. · Inflation is not very harmful to the economy. Note 1: Again, since here we are talking about future we don’t have strengthened or weakened arguments based on the conclusion as future is unknown. That the economists are correct. But all these are secondary assumptions. The argument is based on caused and effect relationship and in such cases the major assumption is the one where cause leads to the effect and in this context, the major cause is devaluation and the effect is inflation. Thus, the assumption is devaluation leads to inflation. Let’s now do an example of the format and style that you should be expecting in the exam. In a laboratory study, 160 rabbits in an experimental group were injected with serum D, while 160 rabbits in a control group were injected with a harmless sugar solution. Within two weeks, 39% of the experimental group’s rabbits had contracted jungle fever, a highly contagious and fatal disease. Therefore, jungle fever must be caused by some substance similar to the substance found in Serum D.
40 % of the rabbit among the control group had also contracted jungle fever within two weeks. Serum D contains substance extracted from the root of a poisonous jungle wildflower. the blood of jungle fever victims invariably contains a high level of certain toxic substance also found in Serum D.
Nearly all the rabbits which contracted the general fever died within two days of the appearance of the first symptoms. Sol: This is the Argument based on analogy. Break-up 39 % of rabbits injected with Serum developed Jungle fever. In the other group, much fewer rabbits developed Jungle fever. Serum D must have some substance that causes Jungle fever. Apart from the fact that one group was given Serum D and the other wasn’t the two were kept in similar conditions in all respects. A A strengthens the argument as naturally 0.01 % rate is minute and insignificant whereas 39% is an alarming number. Therefore, it gives weight to supporting the premise. B Whereas B, weakens the argument by contradicting the premise by stating that 40% of the rabbit of the control group also contracted Jungle Fever when the premise state that 39% of the other group injected with the Serum D developed the fever. This argument shakes the very support of the conclusion. C It is an irrelevant argument as Jungle wildflower has no correlation with Jungle fever so this does argument does not create any impact in supporting the conclusion. D This argument strengthens the conclusion by denoting a high level of correlation between the similarity between the blood of the victims of Jungle Fever and the ones injected with serum D.
E This again has no relevance in the current scenario. It just merely states that Jungle fever is a fatal disease and rabbits die within 2 days of its contact. By no means, this argument provides relevance to the premise or the conclusion. Henceforth, the question arises out of the two strengthened arguments A and D which one greatly strengthens? With little thinking and insight we could reason out that argument A is not that relevant and great strengthening argument in the sense that it only gives credence to the fact that the experimental group contacted with high rate of fever and doesn’t really highlight the triggering cause of Jungle fever and hence doesn’t form strong reason in support of conclusion whereas argument D strongly correlates Serum D with Jungle fever. Thus, the conclusion that some substance found in Serum D causes jungle fever would be greatly strengthened if the substance and the fever were invariably found together, as stated in the argument D.
The above example was just one type and there could be many more complicated questions with tricky and baffling language but with the help of the above-mentioned strategy and lots of practice you can get hold of good command over this topic.